This is one of my favourite salads to welcome the cooler months of Autumn. It celebrates beautiful seasonal produce with a hint of creamy goat cheese and crunchy walnuts. Perfect paired with roast chicken or grilled fish for protein or as part of a shared vegetarian meal too. Preheat oven to 200°C and line a large baking tray with greaseproof paper. Place pears cut side down on the tray and bake for 30 minutes. If you are using red onion, drizzle with a touch of olive oil and place on separate tray to bake at the same time as the pears. While the pears are cooking, juice the lemon and pour half over the kale leaves, gently massaging into the leaves to tenderise them. 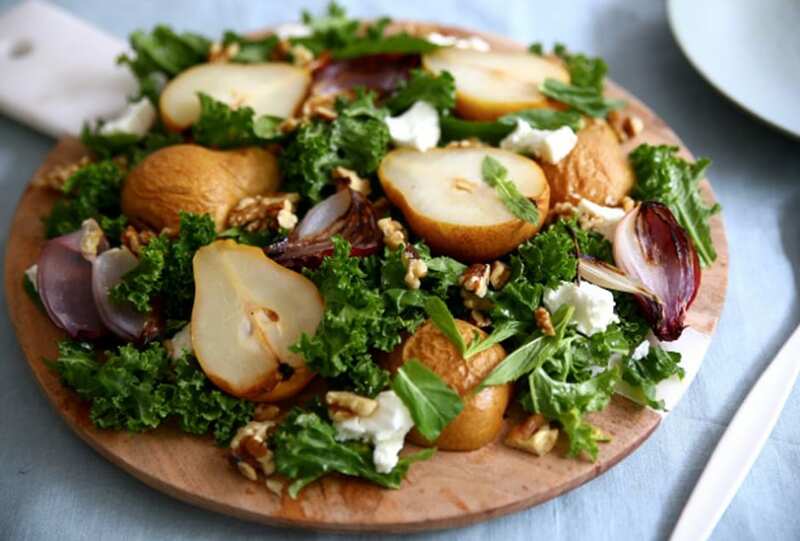 Once pears and onion are cooked remove from oven and allow to cool slightly before arranging on a serving platter with mint leaves, goat cheese and walnuts. Drizzle with balsamic vinegar, remaining lemon juice and a touch of olive oil, season with sea salt and black pepper and serve.